Visitors and exhibitors of the Composite-Expo exhibition is a target audience that you are able to represent your services to. The Composite Expo exhibition offers you a great number of advertising promotions of your company – from the direct exhibiting to numerous marketing opportunities. Sponsoring allows you to make a statement about your company as during the event itself so before the event during the advertising campaign of the exhibition. Sponsorship let you make an impression that keeps long after the show closes through our exclusive sponsorship opportunities. Regarding the sponsoring opportunities, please, contact the management of the exhibition. 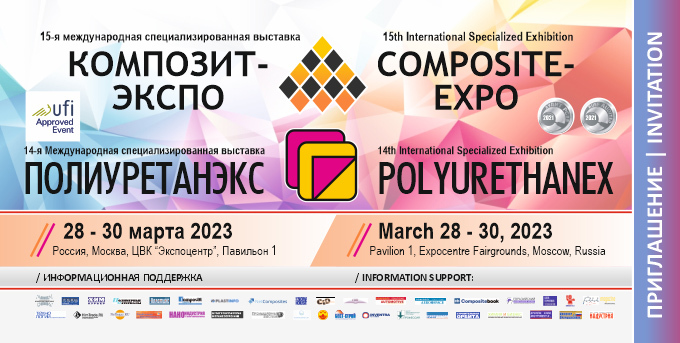 To book a stand at the 12th Composite-Expo 2019 Exhibition please use the online-form. If your company wants to get one of the best booths, it is possible to book it right now! In 2019 Exhibition will pass from April 23 till 25 in Pavilion 1 of Expocentre Fairgrounds, Moscow, Russia. Practical uses of composite materials in different industries (R&D Conference) - it`s the chance to present your company to professional audience. This is the workshop for the exhibitors to do presentations about their new products, materials & technologies. Use the online registration form and get your free invitation to the 12th Composite-Expo 2019 Exhibition. Free entrance availible during April 23 - 25, 2019. The invitation is valid for the 11th Polyurethanex 2019 Exhibition as well.